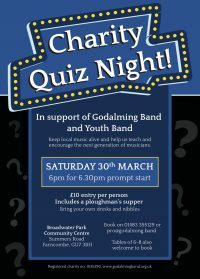 A fun quiz night in support of Godalming Band and Youth Band. £10 per person including ploughman’s supper. Please bring your own drinks and nibbles, no bar. Doors open at 6.00pm for a 6.30pm start at Broadwater Park Community Centre, Summers Road, Farncombe, Godalming GU7 3BH. Contact Dominic on 01483 355129 or pro@godalming.band to book (tables of 6-8 also welcome).